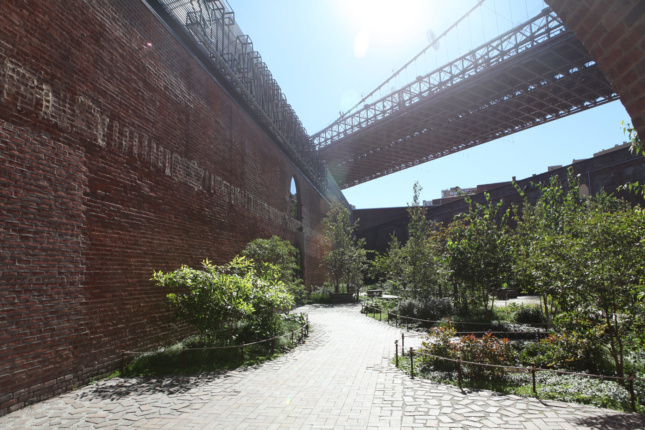 This is the thirteenth in a series of guests posts that feature Archtober Building of the Day tours! 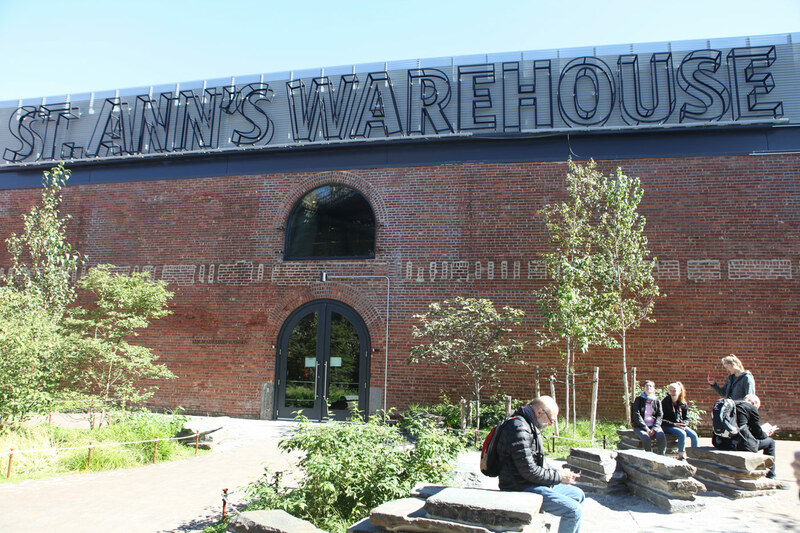 We’re at the halfway point of Archtober and today’s Building of the Day tour brought us to Brooklyn to tour Marvel Architects’ AIANY Design Award-winning St. Ann’s Warehouse. We met our tour guides, Lissa So, AIA and Zachary Griffin, RA, in the Max Family Garden adjacent to St. Ann’s Warehouse where they gave the group some historical context for the building. The original structure was built in 1886 and consisted of five stories. In the 1940s, the building was lowered to two stories and was later abandoned. The Silman Group was brought in in 2000 to strengthen the existing brick walls, but the structure stood as a shell until Marvel started construction in 2013. 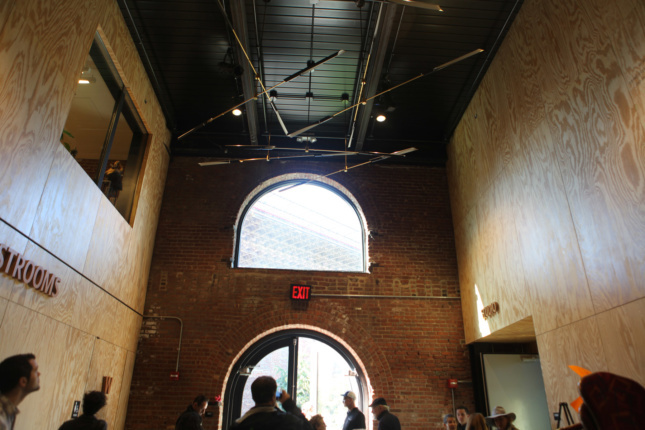 So and Griffin told us how their primary design goals were to respect the existing historic brick walls while giving St. Ann’s a wide open floor plan for their activities. Upon entering the lobby, you immediately notice how the walls are primarily unfinished plywood. This was entirely intentional as Marvel wanted to use as little paint as possible in order to play the new walls off the old brick walls. It gives it an old, industrial look which works well in the space. 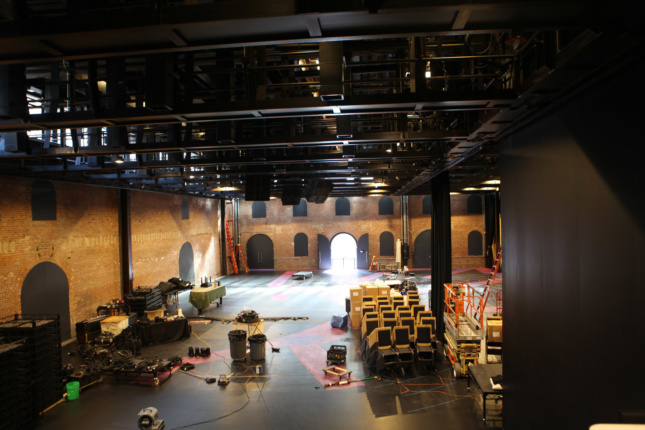 Inside, the designers wanted the lobby and main floor space to feel continuous, so there are no doors separating the main lobby area from the performance area. This really allows patrons to grasp the scale of the building. Perhaps the most noticeable feature of St. Ann’s is the glass brick wall atop the historic brick walls. The existing walls are 24 feet tall and Marvel needed an additional seven feet to accommodate new mechanical areas. So and Griffin decided to use glass bricks after trying out almost every other material since that gave them the best acoustics in the space while also nicely complimenting while not explicitly imitating the existing brick. Being directly under the Brooklyn Bridge meant that acoustics were an extremely challenging feature to deal with. 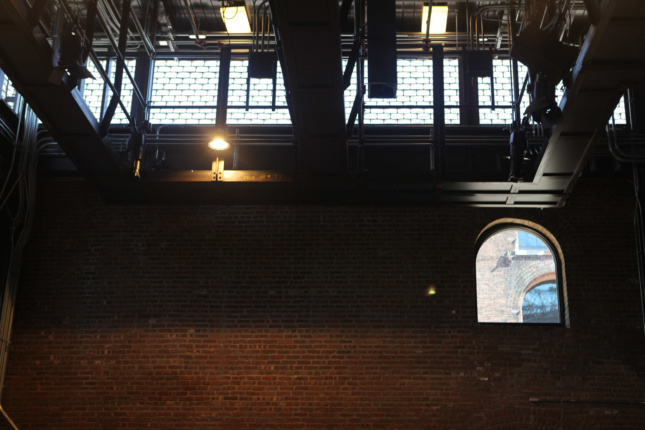 The glass brick also allows ample natural light into the space, a nice change from other theaters. The main staging space is very flexible by design. Seating can be added or removed as needed and the floor is Masonite which allows St. Ann’s to paint and replace them. Working with Charcoalblue, Marvel built a very intricate catwalk in the newly added space above where they hid the electrical, lighting, and HVAC systems. Marvel began construction shortly after Sandy, so there was a concerted effort to put mechanical systems up above in case of another catastrophic weather event. One of the more interesting parts of the building is the bathroom adjacent to the lobby. Marvel originally wanted a unisex bathroom in the space, but the Department of Buildings would not allow that to happen. As a compromise, Marvel built a common area with sinks and mirrors. 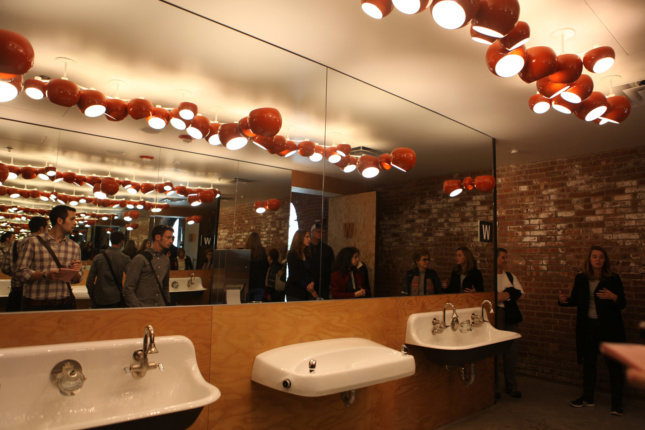 The unique lighting fixtures from David Weeks Studio and infinity mirrors go a long way in making the bathrooms a quirky, fun part of St. Ann’s. We’re taking off the next two days to allow everyone to enjoy the amazing selection of buildings offered by Open House New York Weekend. We’ll be back Monday for our visit to Pivot! About the author: Jacob Fredi is the Public Programs and Exhibitions Coordinator at the Center for Architecture. When he’s not on Building of the Day tours, you can find him playing board games (Settlers of Catan!) and brewing his own beer.